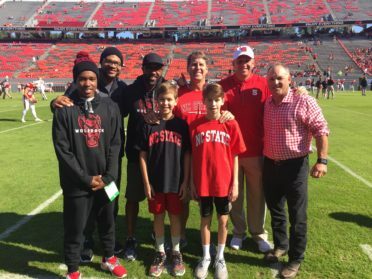 Imagine this — a behind the scenes tour of all that is NC State football with Terrence and Torry Holt. And it’s homecoming. And the Wolfpack take home the W. Gordon Grimes and his two sons, Will and Jacob, didn’t have to imagine this. It all started last January when Gordon attended our annual Holt Brothers Playoff Party that benefits kids who have a parent with cancer. Luck was with him that day — he won the NC State Game Day Experience raffle prize which is always a crowd favorite. So what was the experience like? First, they took a tour of the players’ locker rooms, weight rooms, physical therapy stations, and dining facilities. Then they joined the team in the locker room, hearing the Coach Doeren’s pre-game speech. They also visited the control room in Carter-Finley where broadcasters and reporters view the game. With almost total access, Gordon said, “Torry and Terrence were great hosts. The whole day was incredible, but I would say that running behind the team through the tunnel and onto the field topped it all. The fireworks and smoke made it feel so real; both my sons and I thought it was a tremendous experience.” This was the first time Gordon or his sons had ever been on the field during a game. This year our Holt Brothers Playoff Party + Ultimate Tailgate Presented by PNC will be January 22nd at the NC State Close-King Indoor Practice Facility. The game will be displayed on the big screens and there will be great food, spirits, celebrity guests, activities and more. Gordon says, “The Playoff Party is a great chance to watch the NFL Playoffs with friends, while contributing to a greater cause for children whose parents have cancer.” And, like Gordon, you’ll have a chance to win the NC State Game Day Experience or even Super Bowl LI tickets. Don’t miss out — get your tickets now!